We don’t like pointing the finger or having to blame anyone, but there are some sewer line issues that are usually caused by the homeowner themselves. That includes things like clogs formed after the wrong things are put down the drain or in the toilet. However, there are even more sewer line issues that occur simply due to nature. But that doesn’t mean you’re powerless against them. With due diligence and the right combination of preventive sewer repair services in Oxnard, CA, you can stop these sewer line issues before they even happen. Nature is full of beauty and wonder. The fact that tree roots can actively seek water through the ground is undeniably incredible. 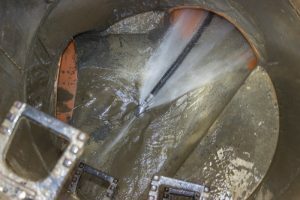 Loose connections and hairline cracks in the sewer pipe can release water into the surrounding soil. It’s just enough to attract tree and shrub roots. As the roots make their way inside the pipe, they can clog the whole line. A hydro-jet can blast away the roots, but the pipe may also need replacement to ensure that the leak isn’t contaminating the soil. The way to prevent it is simply by seeing it ahead of time. You can do that with regular video pipe inspection, which can help find these clogs before they become too large. A good plumber will also be able to find hairline cracks in the pipe long before they can become a bigger problem. When wastewater is ejected from your plumbing system, there’s no mechanism that “shoots” it over to the waste treatment plant. Instead, we rely on gravity. Sewer lines are positioned in an angle that lets gravity do most of the work for us. However, shifting soil can cause the position of the pipe to move, possibly making some of the pipes sag. This creates a dip that causes paper and waste to buildup instead of flowing through the line, and it can eventually create a blockage. Cleaning out this kind of clog may provide a temporary solution, but ultimately, the pipe will need to be excavated and replaced. Once again, you can rely on video pipe inspection to find these potential clogs before they happen. That can help your plumber notice a sagging pipe long before it becomes an issue. There are several reasons a sewer pipe can break, and it won’t be any fault of your own. As soil shifts throughout the seasons, it can put stress on the pipes can cause them to rupture. Older pipes are at risk of corroding, which eventually leads to significant leaks. Pipes are held together with seals, and as those deteriorate over time, they can cause sewage to leak out. Once again, we’d suggest a video pipe inspection to spot any of these issues long before they appear. If you suspect your sewer lines are in trouble, contact Husted Plumbing today to schedule a service. Family owned and operated since 1935.